Limited Time Only! Cheesy Double Crust Pizza! A tradition of family, service and genuinely delicious dining. 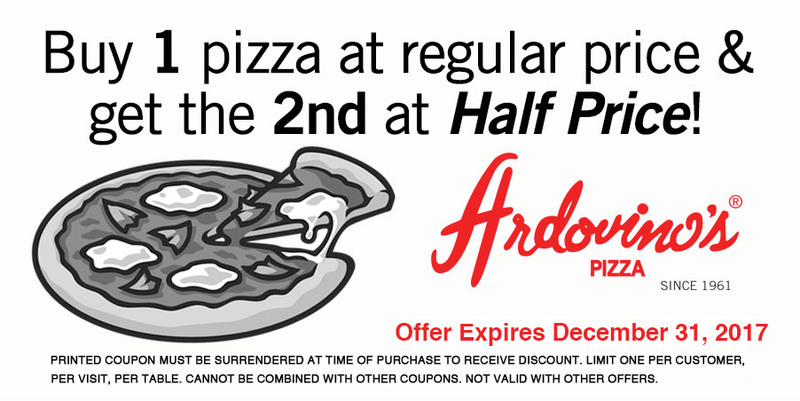 Buy one pizza at regular price and get the 2nd at half price. This deal won't last forever, so get the coupon here now! Ardovino's Pizza. A tradition of family, service and genuinely delicious dining. Ardovino's first opened its doors in 1961 at its Cincinnati Street location. The original Ardovino's was an Italian gourmet food mart. The evolution to a restaurant and delicatessen happened over time as the business evolved. Today, over 50 years later, Ardovino's Pizza has established itself as one of El Paso's landmark dining venues with four restaurants across the city including: downtown, west, east and on the northeast side. Ardovino's Pizza built its reputation on creating mouthwatering signature pizzas, salads and sandwiches. Their house favorite pizzas, most notably: The Joanna's, Royal, Four Seasons and Woody are a wonderfully unique blend of vegetables, sauces, pepperoni and other specialty toppings. The Garden Green and Antipasto salads are an easy choice for those looking for something light. Guests craving an old-fashioned deli sandwich will enjoy the Turkey Pesto Sandwich. The walls of the restaurant are adorned with wine racks holding an impressive array of wine and their cooler is lined with cold, domestic and craft beers from across the globe. Diners enjoy outstanding service in an atmosphere that is inviting, with a touch of comfortable elegance. Guests can choose to dine in or the convenience of take out. The restaurant even provides catering for special events. Their open air patios and private dining rooms are the perfect spots for family celebrations and business gatherings. When you visit Ardovino's Pizza, you are treated like family. It is a true local favorite, which is reflected in its ever-growing collection of El Paso dining awards. If you are looking for a delicious meal to enjoy with family, friends or colleagues, look no further than the restaurant that has been bringing El Pasoan's together since 1961 - Ardovino's Pizza. Copyright © 2019 Ardovino's Pizza, all rights reserved.